The steps you take now to winterize your Northeast Ohio lawn might not deliver the instant gratification you get during the growing season—but winterizing your lawn pays off royally come spring. What do we mean when we say winterize? We’re talking about the process of preparing your turf for hibernation and providing it with nutrients so it can sustain itself during the cold stretch. Winterization also includes maintenance tasks, such as leaf removal and mowing to an appropriate height. Also, lawn winterization will give you an edge on spring lawn care. You’ll prevent weed germination—we all know it’s easier and less expensive to prevent weeds than to manage them once they’ve taken root and spread. And, your turf will green up and grow strong once the weather breaks. Plus, by investing in winterizing your lawn now, you can save on potential spring turf renovation expenses. You want to give your lawn a strong foundation heading into winter—mowing back turf, aerating and reseeding—so it can repair in fall and “rest easy” during winter. Commercial property owners and managers in Cleveland and the rest of Northeast Ohio, here are five steps should to seriously consider taking to winterize your lawn before year-end. 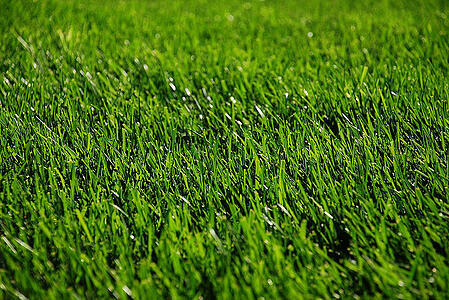 We’re talking about slow-release fertilizer to help the lawn recover and green up in the spring. After the eight-week drought we experienced in Northeast Ohio this summer, many lawns are showing damage like dead spots and thinning out. We can always tell when a property manager cut back on fertilization during summer because the lawn does not rebound as easily with rainfall. Now is the time to reverse your lawn’s health before going into winter so you can prepare for a healthy spring. You might be thinking: Apply fertilizer before dormant season? But…the grass is going to stop growing. Yes, this is true. But a slow-release fertilizer is designed to gradually feed your lawn with nutrients. The goal is not a fast green-up. (The fertilizer you apply in spring is fast-release for this reason.) A slow-release fertilizer will give your lawn the nutrients it needs over the long haul, and when spring comes the lawn is more likely to come back strong. Basically, you’re giving your lawn a vitamin that will give it the support and energy to sustain winter and produce healthy growth when the warm season returns. Now is the time to apply slow-release granular fertilizer, before the ground freezes. You won’t notice the benefits today of a pre-emergent herbicide application. But you’ll thank us in the spring when your beds are blooming with flowers and other property managers are fighting weeds. As they say about “an ounce of prevention,” pre-emergent herbicides block weed-seed germination that occurs in late fall and early spring. Even though we’re out of prime weed time now, those seeds are flying around and can begin germinating in the lawn. That’s why we strongly advise a pre-emergent application in late fall to set your Northeast Ohio lawn up for a healthy, weed-free start to spring. We’ve got good news if your lawn has some dead spots thanks to this summer’s drought. Generally, spots that are smaller than a saucer will fill in with new turf growth—if you properly winterize your lawn. That means you do not necessarily have to replant those smaller dead spots as long as you take steps to prepare the lawn before winter. This is where aeration and overseeding come into play. Aeration helps break up compacted soil that can prevent water, air and nutrients from reaching grassroots. By literally unplugging your lawn—aeration removes inch-diameter turf cores—you also reduce thatch buildup and create a welcome environment for new grass seed. Overseeding in fall is ideal because your lawn will not require extra maintenance for grass seed to germinate. If you seed in spring, you’ll have to carefully water and manage weeds in the newly seeded areas. In fall, before dormancy, the ground is more moist, we get more precipitation, and weeds are generally at bay. When leaves stay on the lawn all winter, they block sunlight and create a dark, moist environment that’s ripe for pink snow mold. Turf needs sunlight, even during dormancy in winter. And, if you allow leaves to sit on your Northeast Ohio lawn in winter, they naturally grow soggy and weigh down the turf. Not only is raking them in the spring more labor-intensive, the grass you’ll find underneath those leaves may be severely damaged. Then, you’re replanting in spring and spending time and money on costly turf renovation. So, don’t wait to clear leaves off of your lawn until spring. Continuous leaf cleanup through fall will allow your turf to “breathe” so you don’t contribute to lawn diseases and potential damage. There’s a balance between cutting grass too short, and not cutting it enough. If turf is too short during the growing season, it can be susceptible to damage from dry weather and disease. But if you don’t give the lawn a final mow before winter, long grass will hinder the entry of air and nutrients to roots. We like to be sure that grass is no longer than 3 inches long before winter. A final mowing with a bagger will pick up stray leaves, even up turf, and ensure that grass is the right height to enter a healthy dormancy. Take the steps now to prepare your lawn for winter: slow-release fertilizer, a pre-emergent herbicide application, aeration and overseeding, leaf cleanup and a final mowing job. That way, your lawn will sustain the harsh Ohio winter and grow strong come spring. 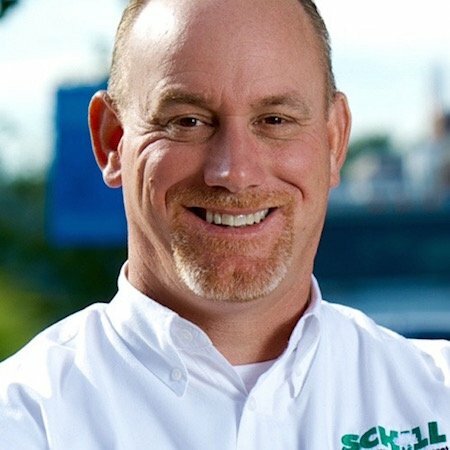 Let’s talk more about ways to enhance your landscape with Schill’s Fall Planting Guide and protect your commercial grounds through winter. Contact us any time at 440.327.3030, or fill out this simple contact form and we’ll get in touch with you.